We are very pleased to announce more artist details for the Yamaha Music Stage (which is in the main arena at The O2, London). The details and names are below. LUCIE SILVAS & DRAKE WHITE. 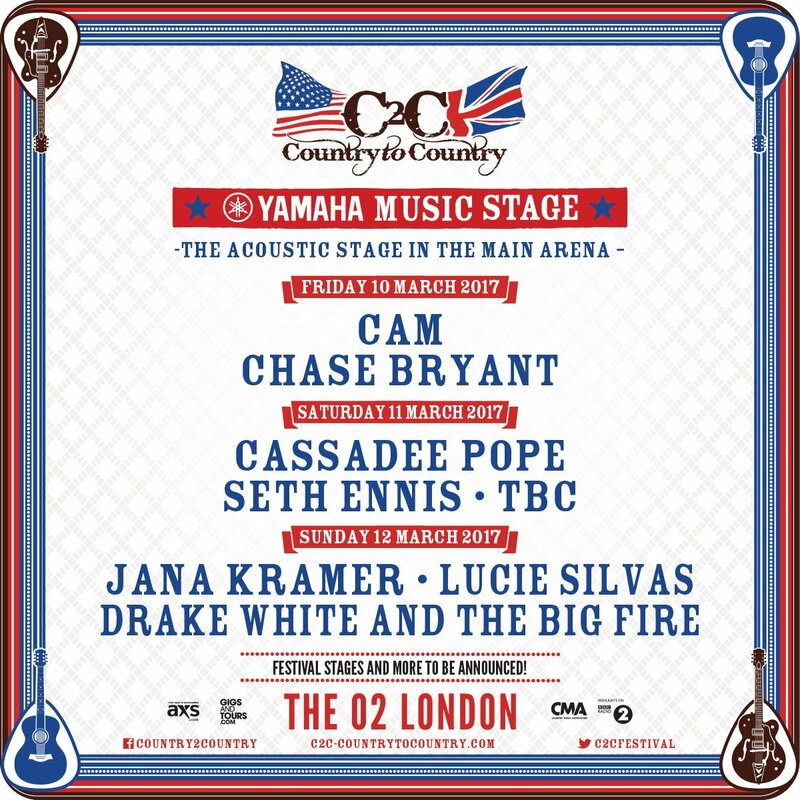 Following the success showcasing some of the best new talent around in 2016, THE YAMAHA MUSIC STAGE in the main arena at C2C will be back with sixstandout acoustic artists performing over the weekend in-between the main stage acts. Last year’s acts included Charles Esten from the “Nashville” TV series, Ashley Monroe, Maren Morris, Striking Matches and Frankie Ballard on the massively popular stage. This 23-year old is a multi-talented Texan singer-songwriter, guitarist and producer who has a strong musical heritage. Chase’s grandfather played piano in Roy Orbison’s first two bands and later for Waylon Jennings. His uncles co-founded the popular group Ricochet, which had several hits in the ’90s. “From the time I was a kid, the only thing I wanted to do was play music,” he says. Because of the Orbison connection, someone suggested a meeting with Roy’s widow, the late Barbara Orbison, a prominent Nashville publisher, who signed Bryant on the spot. That road led Bryant to BBR Music Group imprint Red Bow Records, to whom he’s signed. In early 2017 he’s been touring with Brad Paisley and enjoying the success of his new EP, Chase Bryant. From West Palm Beach, Florida and the first female winner of “The Voice” on American TV, Cassadeehit the ground running with her solo debut, theFrame By Frame EP, which featured “Wasting All Those Years” a track which sold a million downloads and was highlighted by her soaring vocals and an unwavering energy. She had her first number 1 single with“Think Of You”, a duet with Chris Young which led to her first Grammy nod nod in the Best Country Duo/Group Performance and was previously nominated Musical Event of the Year at the CMA Awards. Amplifying the impressive accolades, Cassadee and Chris continued to collaborate with extended dates on the “I’m Comin’ Home Tour” throughout 2016. Recently, Pope released herSummer EP which was produced by Corey Crowder who co-wrote “Think Of You”. Her busy touring schedule has included dates with Tim McGraw and Rascal Flatts. Arista Nashville singer/songwriter, Seth Ennis, is poised for a breakout in 2017, with early nods as a star on the rise following being named as one of SiriusXM’s “Future Five” and an artist to watch by CMT, Pandora, The Huffington Post, Rolling Stone Country and a CMT “Listen Up Artist.” The 24 year-old multi-instrumentalist, co-wrote, co-produced and played all parts on the recorded version of his debut single, “Woke Up In Nashville.” The Georgia native was recently announced to join Country Music superstars Florida Georgia Line on their 2017 Dig Your Roots Tour for dates spanning from February to April,but will take a break to make his UK debut at C2C in March 2017. The multi-talented Jana Kramer (who has already been announced for a C2C After Show) is an actor who played Alex Dupre on the television series One Tree Hill, was a recent finalist on the American TV show Dancing with the Stars and is one of country music’s brightest new stars and a successful singer/songwriter. Named one of this year’s “Next Women of Country” by CMT, Kramer co-wrote more than half of the tracks on her second album, thirty one on Elektra Nashville, which features her smash hit, gold-certified single, “I Got The Boy.” Kramer’s singing career kicked off with the release of her self-titled debut album in 2012, which featured the platinum-selling “Why YaWanna”. She earned the ACM’s New Female Vocalist of the Year award and the distinction of being country radio’s most-played debut artist of the year. Born in the UK but raised in part in New Zealand by her Kiwi dad and Scottish mother, Lucie started playing piano and songwriting at 10 but wasn’t exposed to the music industry until she started singing back-up on tour with the British singer Judie Tzuke. She was then signed to Mercury Records and released two pop records, selling over a million albums in Europe. The next chapter of her life saw her packing her bags and moving to Nashville where she was soon writing and performing with some US artists and musicians. She’s recently released a self-financed album called Letters To Ghosts featuring some of Nashville finest musicians and with the title track winning strong radio airplay. The critically acclaimed Drake White (who has already been announced for a C2C After Show) has been called,"One of the country's most energizing performers”, byRolling Stone Country. He’s a rapidly rising new star who released his acclaimed debut album, Spark on Dot Records, in the summer of 2016. The foot-stomping singer/songwriter and nature enthusiast co-wrote 10 of the tracks and the cover tells the visual story of who Drake White is as an artist, husband and native-Alabamian. The images imprinted into his silhouette paint a narrative of White's life, including his wife Alex, his hometown church (where his grandfather served as preacher), his dog Writer and other mementos that inspired the record. White has been touring as opening act on Zac Brown Band’s Black Out The Sun tour in addition to his own headline dates.